The National Museums of Scotland advertise themselves with the slogan ".. show Scotland to the World and the World to Scotland" achieving this through extensive collections built up over more than two centuries". Based mainly in Edinburgh the main collection is well worth seeing and the pictures on the following pages will give a flavour of what is on display. 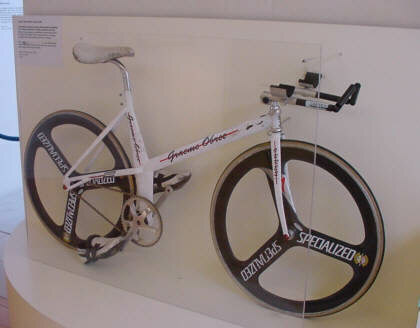 This is the "home made bike" that Graeme Obree won a variety of records and championships on.